He's "an elusive little critter", but if you look around from the lift you're bound to see Farmer Dave before too long. He's skiing every storm cycle. Well, every day for that matter. Here about his techniques that include using a router to put custom scales in his skis, and how he was coined the "Turn Farmer". Classic and exclusive photos of Farmer Dave's art work included in the transcript below. Johnny B: Hello powder skiers. Welcome to AltaCam.com. My name is Johnny B, and today I have a very special guest - the one and only, often imitated never duplicated, Dave Van Dame, otherwise known as the Snow Farmer. Good to see you, Dave. Farmer Dave: Good to see you again, Johnny. I enjoyed skiing with you the other day. It's good to have some snow on the ground. Johnny B: It was my pleasure. It's great to finally get together with you. I've been chasing you down. Hunting you for a couple seasons now and I finally tracked you down. Farmer Dave: Well, I'm an elusive little critter. Johnny B: Yes, you are. Thanks for being here. Good to see you. 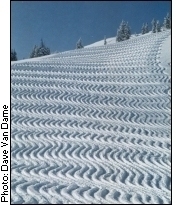 Dave, you got a unique style of skiing, you call it farming a slope with your runs taking place right next to your last run. Describe this method and its origins and who started calling you the Farmer? Farmer Dave: Well, I used to ski with another fellow named Walt Shylock, who I actually knew from Delaware and he got himself transferred out to Salt Lake with Hercules shortly after I moved out here. And when I first started backcountry skiing, it was with full downhill gear and army surplus skins, nonreleasing heal, I mean the heal didn't lift up when you're hiking. We go up White Pine or wherever and it's usually been a while since it snowed so we were looking at fairly small areas to ski that weren't wind damaged or sun damaged for skiing or – well, there wouldn't that much problem with ski tracks back then, but still we found that if we put in a climbing track and he skied in one area and I skied in the other and we skied this way where we just each of us put down our first track and then we moved over 18 inches and put in another one. We could come back to the same area over and over again if we wanted to and not to have looked around for new snow. And a lot of people you know they want to be out in the mountains, they want to go and see different places and to me it's more the exercise and the feeling of skiing so I can be happy with a relatively short run. And it's easier to control your temperature that way because you don't get hot or cold either going up or going down and you can leave your pack in one place and just put in a climbing track and do lap after lap. And then also, it works because other people frequently don't want to put skins on to do that and I developed this technique where I routed the bottom of my skis to make it so that I can climb without putting skins on it. So when I get to the bottom, I just turn around and head back up and there's no turnaround time really. So I can do a short lap and not have to worry if it's going to take several minutes to put my skins on and a minute or two to take them off and stow them way. Well, I don't have any of that over head so I can do short laps and do a lot of them. Johnny B: So let me get this straight, you took a router and you cut scales in the bottom of your skis? Farmer Dave: ...that were deeper in the front than they were in the back. I got to thinking about that and I said, "I bet I can make those" so I made a jig to hold the router at an angle and experimented with different types of bits and ended up with a dovetail bit. And figured out a way to put them in without hitting the edges and things like that and experimented how big to make the pattern. There were number of things that went to it but that was part of the fun, was figuring out how to do it, doing it myself, and coming up with something that was workable. And you can't climb as deeply as you can with skins, but its lighter and its there all the time. If you are doing a trip where you're going up and down hills, you don't have to try to figure out you know how am I going to get from down here up there, you just walk up there. Johnny B: And for the kind of farmers' field you're looking for, not too steep, not too flat so it's perfect. Johnny B: So Walt Shylock, is that how I pronounce his name? Johnny B: Did he coin the term "Farmer"? When did that happen? Farmer Dave: I'm not sure how it came about. There was a picture one time I submitted to the Sports Guide for a photo contest they had. We saw it earlier. It was the one with the trees in the middle of it. Farmer Dave: And they didn't have a category for it but they said that they had to give me recognition. They published it and they said it's a unique picture that doesn't fall into our categories. And we're not sure how we did it but we suspect he used the disk harrow, which is a farming implement. And the first time that I heard the term, I was out by myself, I think it was up at the top of Catherine's Pass somewhere and a fellow came up behind me, his name is Keith. He is a long-time backcountry skier. He used to ski with Bob Ada. Farmer Dave: And he caught up to me and he said, "Are you the farmer?" I said, "No". He says, "Aren't you the guy that has those scales on the bottom of his skis, skis next to each other?" "Yes". "Oh, well, we call you the farmer." So there I am. I'm the farmer. Johnny B: There it is. Remember what year that was? Farmer Dave: Yes. It could have been in probably mid-to-late 80s somewhere. Johnny B: Mid-to-late 80s. All right, there's a piece of history for you. You heard it right here on AltaCam.com folks, what's your obsession with this? Is it just something that has carried on from when you first started and now it's become your life's work? Farmer Dave: Well, I didn't know that I would call it an obsession, but I do enjoy a lot and I do put a lot of time into it. To me it's – when I was working, I always looked at skiing as a way that totally rejuvenated me because I knew when I was skiing, I couldn't think about other problems. I would stay focused and if my line started wondering, I would plow into a mogul and that'd be the end of it. Farmer Dave: And so when I was skiing, it was a release for me. It was a way to that take my mind off of whatever was going on at work or at home or whatever, and allowed me to rejuvenate and go back to work refreshed. And a lot of the people that I worked with put in a lot more hours, but they never produced as much, saleswise. And I always thought, my boss would be mad at me if he knew I was skiing when he thought I should be working. He sent to me a training seminar one time and I was supposed to give a big presentation Monday morning on what I had learned. And it snowed about 18 inches Sunday night. Johnny B: Well, I think it made you a better guy because you wouldn't be here and we wouldn't be so inspired by you if it wasn't for your devotion to the powder. So that leads me to my next question. Who inspires you? What skier inspires you? Farmer Dave: Well, all you have to do is ride up the lift at Alta and when you look down, there's any number of skiers that are just great skiers. I mean one of the beauties about Little Cottonwood Canyon is it attracts the best skiers in the world. Farmer Dave: And we all have different techniques and different styles and mine just happens to be enough different from most other people that I stand out somewhat, but I can't do the things they can do just like most of them don't want to do what I do. So we all do it a little bit different, but the point is that you're out there. You're enjoying nature. You're keeping your body fit. You're meeting nice people. You're meeting people from all over the world, and what's not to like about it? Johnny B: Absolutely. I couldn't agree with you more, Dave. There you have it folks - the Turn Farmer. My name is Johnny B for AltaCam.com. Thank you all for listening. Keep the Ptex side down, and we'll see you out there. Thanks a lot, Dave. Farmer Dave: Thanks for your time, Johnny. Good talking to you. Johnny B: Let's go skiing.